Almonds may be the most popular nuts in the U.S. But, did you know that macadamia nuts are packed with just as much nutrition and health benefits? Macadamia nuts are also quite delicious, particularly on their own or made into a creamy nut milk. This amazing nutrient-dense tree nut is loaded with healthy fats, antioxidants, protein, manganese, B vitamins, magnesium, copper, and more. As a result, macadamia nuts are good for the heart, weight loss, digestion, bone health, brain and nervous system health, and for reducing chronic inflammation and arthritic symptoms. 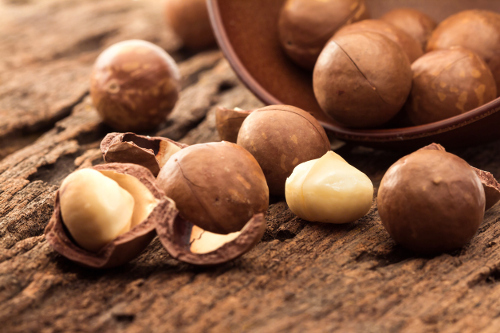 Read on to discover more about macadamia nuts, and its various health benefits and uses. The macadamia is a genus of tree species native to Australia, particularly Central and Southeastern Queensland and Northeastern New South Wales. Interestingly, the macadamia nut is also called the Queensland nut and the Australian nut. The nut is also found in the tropical and subtropical areas of Hawaii, Brazil, Middle Americas, and South Africa. The evergreen macadamia tree belongs to the Proteaceae family of plants. They can grow up 40 feet tall and thrive in mild, frost-free climates with lots of rain. The tree will reach maturity and begin to produce fruit around seven years after being planted. The nuts are harvested in the fall take from the tree. After the husk is removed, the nuts are then dried. The shell is removed with a nutcracker. Also, some seeds are suited for commercial production, while others are best for the home garden. The macadamia tree found its way to Hawaii around 1881 and was used mostly for reforestation and as an ornament. In 1948, the Hawaii Agricultural Experiment Station introduced several macadamia trees, which led to Hawaii’s famous macadamia industry. In the mid-1900s, the macadamia tree was brought to California from Hawaii. There are about seven macadamia nut species grown in the wild. Some macadamia seed coats are rough and pebbled, while others are smooth. But, there are only two that are edible and cultivated in farms around the world—the smooth-shelled Macadamia integrifolia and the rough-shelled Macadamia tetraphylla. The white, edible kernel of a macadamia nut features a smooth buttery surface that tastes sweet. The kernel is also made up of 65% to 75% oil, and six to eight percent sugar. What are macadamia nut nutrition facts? Macadamia nuts are loaded with healthy fats and are a good source of saturated fat, in particular. Although these nuts are high in calories, they also contain fewer omega-6 fatty acids than some other nuts. It is also a good source of protein and fiber. Macadamia nuts are also incredibly high in manganese, vitamin B1, magnesium, and copper. They also contain trace amounts of vitamins C, E, B2, B3, B5, and B6, as well as folate, calcium, iron, phosphorus, potassium, zinc, and selenium. The following is a comprehensive macadamia nut nutrition chart with information for one ounce of macadamia nuts (or 28 grams of the tree nut). What are the health benefits of macadamia nuts? The flavonoids in them help prevent cell damage while protecting cells from environmental toxins. The flavonoids then get converted to antioxidants, which help destroy free radicals in the body and protect against disease. The phytonutrient content in these nuts, like stilbenes and phenolic acids, will also fight diseases like cancer. It also assists with weight loss, digestion, strong bones, arthritis and chronic inflammation, and brain and nervous system disorders. Let’s take a deep look into how macadamia nuts are so beneficial. The healthy saturated and monounsaturated fats in macadamia nuts help decrease cholesterol and triglyceride levels. As a result, you can keep your arteries clean, and lower your risk of coronary heart disease. A study published in the Journal of Nutrition in 2008 found that these nuts reduced cholesterol levels and improved overall heart markers. The healthy fat content helps lower the lipid/lipoprotein risk factors associated with cardiovascular disease. For the study, 25 people were randomly given macadamia nuts and compared with people fed a standard American diet. The good fat content in macadamia nuts will actually reduce your appetite. The palmitoleic acid in them will also increase metabolism, and as a result decreases fat storage. You will likely be satisfied with just a few macadamia nuts, which have a nice balance of fats and other nutrients. You can also reduce hunger with macadamia nut’s fiber and complex carbohydrates. These include mucilage, amylopectins, hemicellulose, lignans, gums, and insoluble cellulose. Evidence published in BMJ Open in 2014 also suggests that nuts like macadamia may have a positive effect for preventing metabolic syndrome—a cluster of conditions that includes high blood sugar, increased blood pressure, abnormal triglyceride and cholesterol levels, and excess body fat around the waist. The insoluble and soluble fiber in macadamia not only helps you feel full, but it also promotes good digestion and toxin elimination. Being high in copper, macadamia nuts benefit the efficient utilization of iron, while assisting in proper enzymatic reactions. The magnesium, copper, manganese, and vitamin B help create healthy neurotransmitters. These are important chemicals needed by brain cells to send signals to the brain. The high amount of oleic acid in macadamia nuts also promotes brain health, while the palmitoleic acid will also protect nerve cells in the brain. Moreover, the omega-9 content will also benefit mood, improve memory, and prevent neurological diseases, such as Alzheimer’s disease. Macadamia nuts are loaded with phosphorus, magnesium, and manganese. These nutrients help strengthen teeth and bone mineralization and aid in nutrient transportation and absorption. Kidney disease is known to affect the body’s ability to absorb manganese and calcium, and this can lead to bone disease. That is why the high manganese found in these nuts can not only strengthen bones, but also fight kidney problems. Omega-6 fatty acids are found in many unhealthy foods like potato chips, salad dressings, pasta dishes, processed meats, and pizza. This is an easy way to increase inflammation in the body, which can lead to diabetes, heart disease, cancer, and arthritis. Most nuts have more omega-6 than omega-3; however, macadamia nuts are lower in omega-6. The addition of a few macadamia nuts weekly can add valuable nutrients like protein and fiber to the diet without too much omega-6. In a study published in Pharmacognosy Magazine in 2015, researchers examined the ability of Australian plants like macadamia. The researchers concluded that macadamia nuts are beneficial for treating and blocking the onset of rheumatoid arthritis. Since macadamia nuts are the most sought-after nuts in the world, they can be very expensive. Besides being a food, macadamia husks are used for mulch or fertilizer, while in Japan macadamia oil is used in the cosmetic industry to make shampoo, soap, and sunscreen. You can find macadamia nuts in the bulk section at health food stores or grocery stores. Store them in a cool place like your pantry or refrigerator. At the same time, it is best to make sure these nuts don’t contain moisture. Consume macadamia nuts in its natural buttery form, or roast them. Simply, preheat your oven to 225 to 250°F. Place the nut meat on a cookie sheet with parchment paper, and roast the nut pieces for about 10 minutes (keep an eye on the nuts since different oven temperatures can vary). Remove the nuts from the oven before they begin to turn slightly brown. Allow them to cool, and store in a tightly sealed container. After roasting, the texture and color both become consistent. Enjoy a handful of macadamia nuts as a crunchy snack, or use them in pesto, nut butter or baked goods like cookies, trail mix, pastries and breads, or garden and fruit salads. The following are a couple of unique macadamia nut recipes to help you enjoy them. In a high-speed blender, combine nuts, probiotic capsules, and water until completely smooth. Place the mixture into a cheesecloth or nut milk bag, and wrap tightly. Place the bag in a sieve and set it over a bowl. Allow air to circulate all the way around, and let it ferment at room temperature for 36 to 48 hours. You could also place the nut mixture in a dehydrator at 100°F for 24 hours. Set aside the dill. Mix the remaining ingredients into the cheese, and dollop the mixture onto a piece of parchment paper. Roll it tightly around the cheese, and twist both ends like a candy wrapper. Store it in an airtight container in the refrigerator for three to six days to age it (the longer it sits, the drier it becomes). If coating the cheese in herbs, remove it from the fridge after two days, and roll the cheese log in the dill on fresh parchment paper. Then seal it in an airtight container, and refrigerate for another two to three days. The macadamia cheese should spend around six days in the fridge before you serve it. Overall, the mixture keeps for two weeks. Soak the macadamia nuts in two cups of filtered water for two to four hours, then drain and rinse. In a high-speed blender, combine four cups of filtered water, salt, and nuts, and blend until liquefied. Strain the milk, and press it to extract as much liquid as possible. If using the dates, vanilla, or ground cinnamon, return the milk to the blender, and combine ingredients well. Then transfer the nut milk to Mason jars for storage. The recipe will make four cups of milk and will keep for three to four days in the refrigerator. Shake the milk well before using it. A macadamia nut is a healthy and nutritious snack that is loaded with manganese, B vitamins, copper, magnesium, folate, healthy fats, protein, antioxidants, and more. As a result, they have been found to benefit heart health, strengthen bones, improve digestion, help with weight loss, reduce chronic inflammation and arthritic pain, as well as keep the nervous system and brain healthy. However, it is best to purchase them in bulk without any added preservatives, salt, and oils. Macadamia nuts are also high in phosphorus, which can be a problem in those with kidney issues like kidney stones. People with nut allergies should also avoid them. Also, be sure to store macadamia nuts in a cool place like the pantry or fridge, although you also don’t want them to contain moisture. Macadamia nuts are delicious roasted. You can add them to fruit or garden salads, milks, and baked goods, or you can make fermented nut cheese with them. “Paleo Foods: Macadamia Nuts,” Paleo Leap; https://paleoleap.com/eat-macadamia-nuts/, last accessed July 11, 2017. “Nuts, macadamia nuts, raw Nutrition Facts & Calories,” SELF NutritionData; http://nutritiondata.self.com/facts/nut-and-seed-products/3123/2, last accessed July 11, 2017.